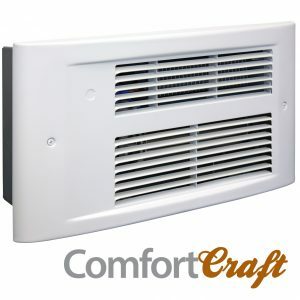 in contact with the finished floor (unlike other fan heaters that require to be installed at least 4″ above the floor). 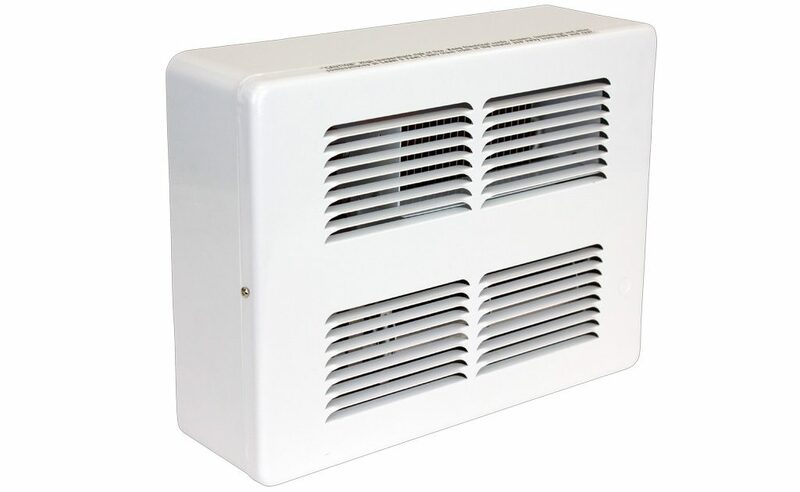 The Pic-A-Watt® feature allows a customers to select from a range of wattage options, tailoring the heater to an area’s specific heating requirements. Baseboard conversion made simple. 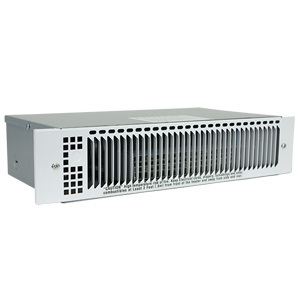 2′ Baseboard = 500W; 3′ = 750W; 4′ = 1000W; 5′ = 1250W; 6′ = 1500W; 8′ = 1750W; 10′ = 2250W. 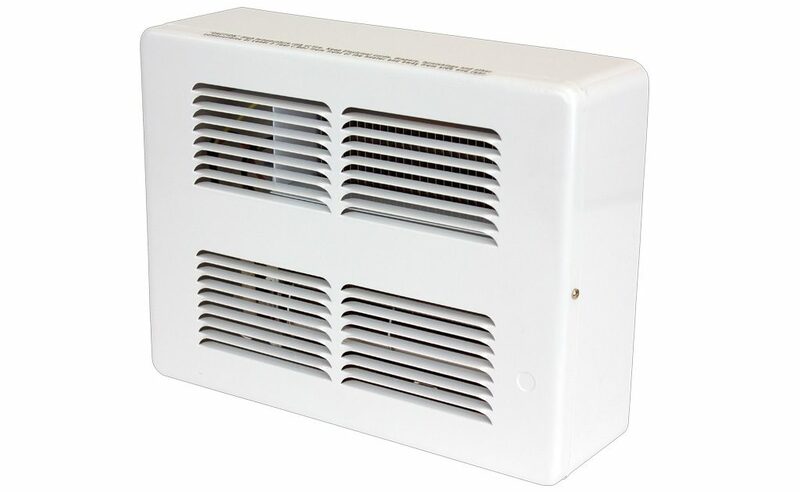 Specifically designed as a space-saving replacement for baseboard heaters, allowing you to reclaim up to 8 linear feet of valuable wall space. 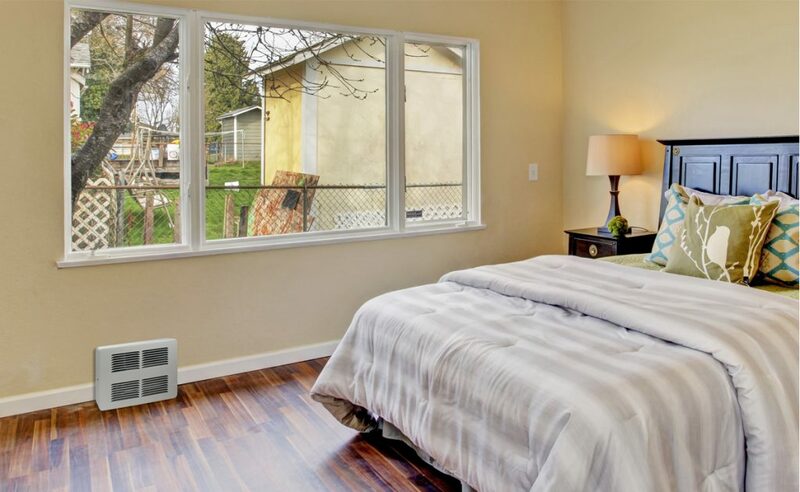 The unique slim surface-mounted wall can allows the heater to be mounted directly in contact with the finished floor (unlike other fan heaters that require to be installed at least 4″ above the floor). 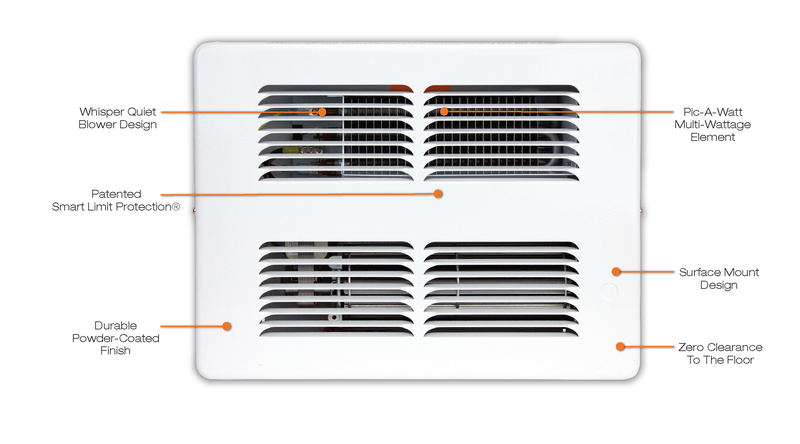 Patented Smart Limit Protection automatically shuts power off to the heater in an abnormal event and must be manually reset for safety. 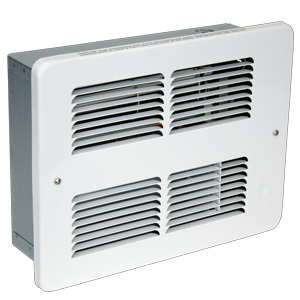 Contractor shall supply and install SL Series wall surface-mounted forced air electric heaters manufactured by King Electrical Mfg. Company of the wattage and voltage as indicated on the plans. 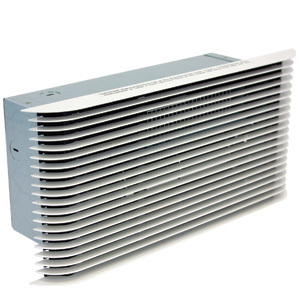 Ratings: Heaters shall be available in wattages of 250 to 2,250 at 120, 208 or 240 volts. The heater shall be approved for surface mounting with zero clearance from the floor. Blower and Motor: A tangential cylindrical blower, delivering 75 CFM, shall be driven by a shaded pole, permanently lubricated, C-frame type motor with impedance protection and sealed bearings. Motors shall be the same voltage as the heater. Elements: Element assemblies shall consist of three steel sheathed heating tubes in a furnace-brazed, plate-finned, block design. Each sheathed tube shall contain coiled Ni-Chrome wire, embedded in an insulator of Magnesium Oxide. The element assembly shall provide up to seven (7) possible wattage configurations available for selection during field installation. The use of external resistors, diodes, or other weak links to obtain multiple wattages will not be accepted. 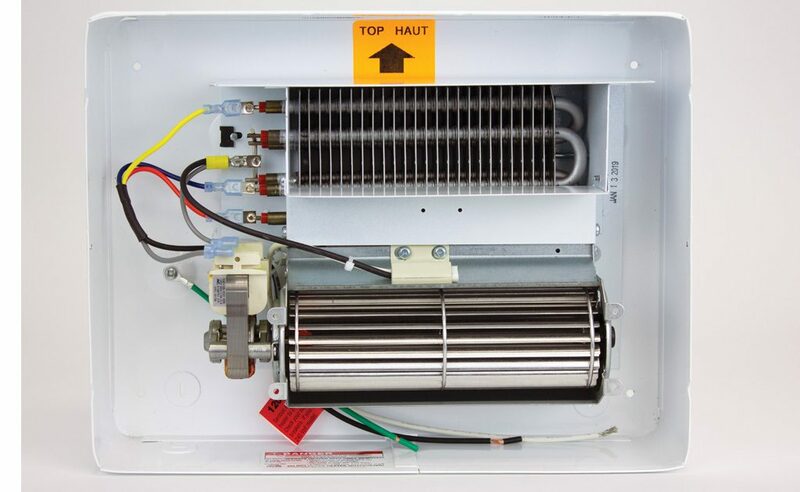 Thermal Overload: Heaters shall be equipped with King’s patented thermal overload Smart Limit Protection®, which disconnects elements and motor in the event normal operating temperatures are exceeded. If thermal overload trips due to abnormal operating temperatures, thermal overload shall remain open until manually reset by turning the heater off for 15 minutes. 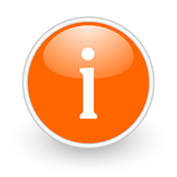 Automatic reset of thermal overloads, which allow the element to continue to cycle under abnormal conditions, will not be accepted. Surface Can: The surface can shall be 20 gauge electro-galvanized steel and shall contain a minimum of three (3) knockouts. The surface can shall be epoxy powder coated and contain a stranded ground-wire. Minimum clearance to floors is 0” and 6” to any sidewall. 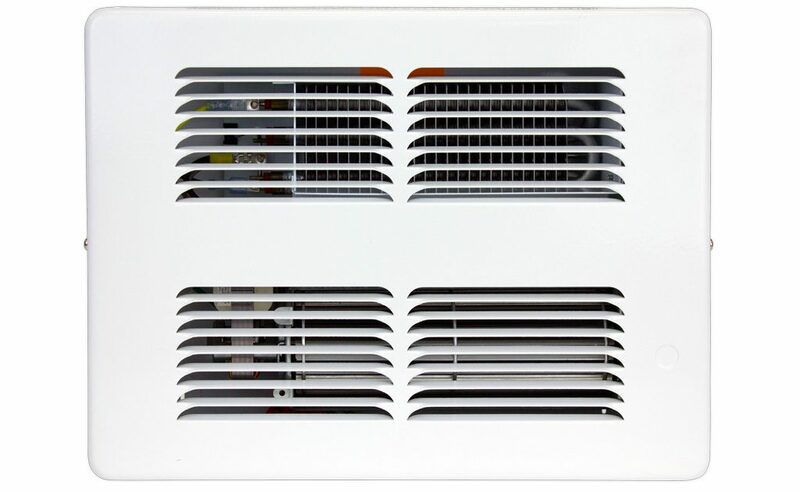 Grill: The grill shall be a louvered, one-piece design with rounded edges on all four sides, with rounded corners to prevent snags from contact with other materials. The grill shall be epoxy powder-coated in the color specified on the plans.